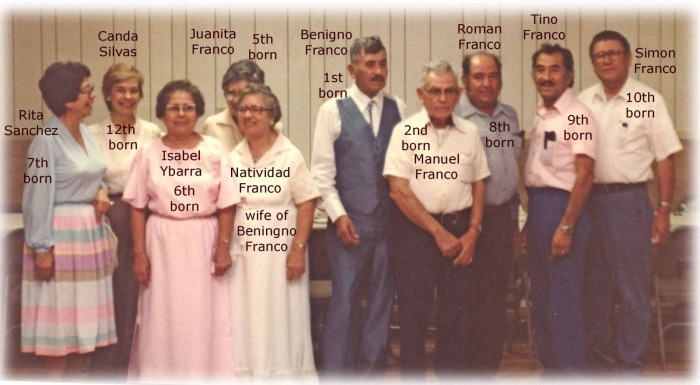 We hope to add more information to this page and the Antonio M. Franco family page. Among the information not yet added is the story of Aleck Smith who lived on the ranch with the Franco family and was a blacksmith. *The family named two of their sons Román. The first Roman (third born) died when he was seven years old; six month later, the family re‐used the name. Antonio Molinar Franco was born in Presidio, Texas on June 21,1881 according to documents. But it is possible that he was born in Shafter but since it did not have a post office the records show "Presidio." There are family stories of the family living in the Shafter area before they moved out to other parts of the Big Bend area. 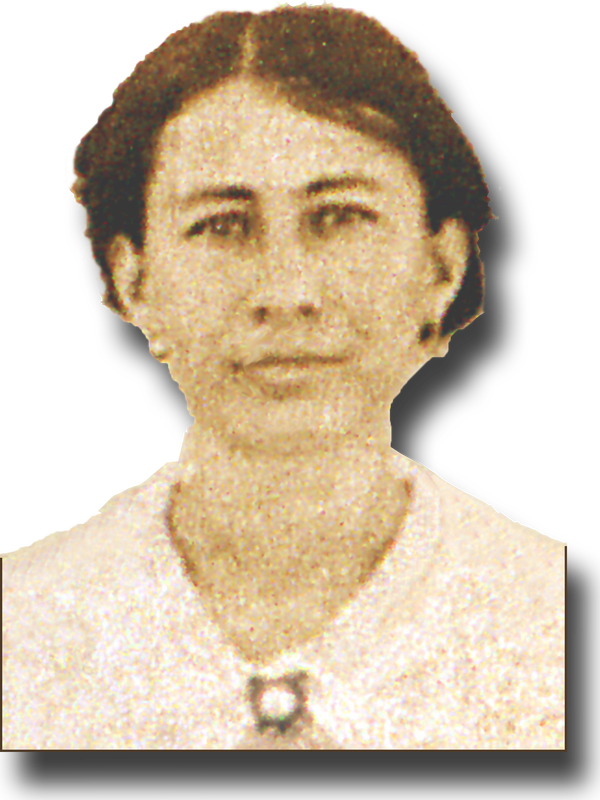 Almost six years later on February 14, 1887 and about 80 miles east of Presidio in La Coyota, Texas, his future wife Valentina Chavarría was born. For unknown reasons when Antonio was only sixteen years old, his father Francisco Franco abandoned the family. Though Antonio was only sixteen years old he had to support his mother and siblings. Some of their uncles helped the family out especially taking in the infant children. Antonio was the oldest of his siblings and his next younger sibling was José Franco was only eleven years old. 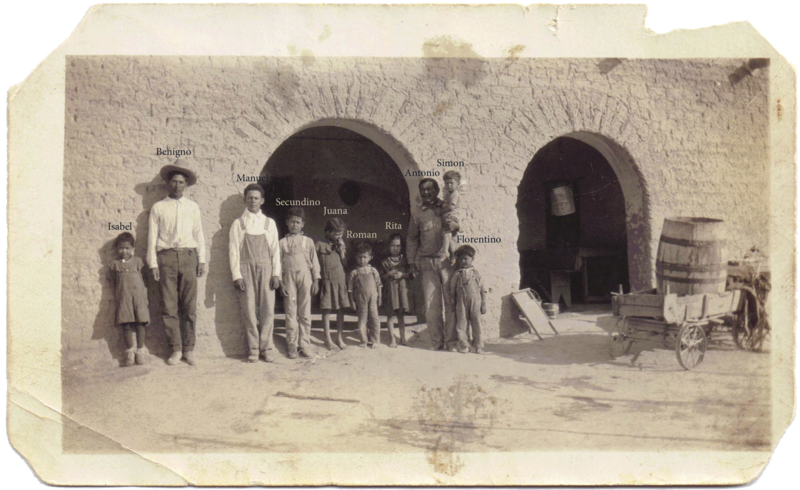 Some of his uncles (in Shafter?) took in some of the younger children, but Antonio at the age of sixteen assumed the burdens of his father looking after his mother, five younger brothers, and one sister, María. Because of this he resented his father and later when his own children asked about his father he would tell them he was an orphan and new nothing about his father. That plus the fact that his father, Francisco Franco, never came back has made it impossible to trace this family back. Perhaps we would see the linkage with the other Francos of the area if we could go back in genealogy. At the very least there might be connections found in Meoqui where the Francos had been before coming to the area around Terlingua. Relatives were still living there so perhaps he went back to San Antonio, Meoqui. Rumors ran in the family that he had gone to San Antonio. Some members of the family related to Antonio's sister María Franco who had moved to East Texas with her husband, Roy Loyless, thought perhaps it was San Antonio Texas. But most of the family thought he went back to his family roots maybe in Mexico. There are several places named San Antonio nearer Terlingua on the Mexican side of the Border all the way from the San Antonio de Bravo across the border from Candelaria, Texas (about 110 miles up the Rio Grande from Terlingua) to San Antonio, Meoqui, Chihuahua about 45 miles past Chihuahua City. If any reader has information on Francisco Franco the family would appreciate receiving it. Click on the "Discuss Franco Family" button to go to read comments about and from the family as well as to add your own information. Ten years after his father abandoned the family, Antonio and Valentina got married around 1907 when he was about 26 years old and she was around 20. They were probably married in La Coyota. But La Coyota was just a settlement and the nearest post office was at Castolón, so it is said they were married in Castolón. Antonio's siblings were still rather young when he got married; the youngest, Francisco Jr. was only eight years old. 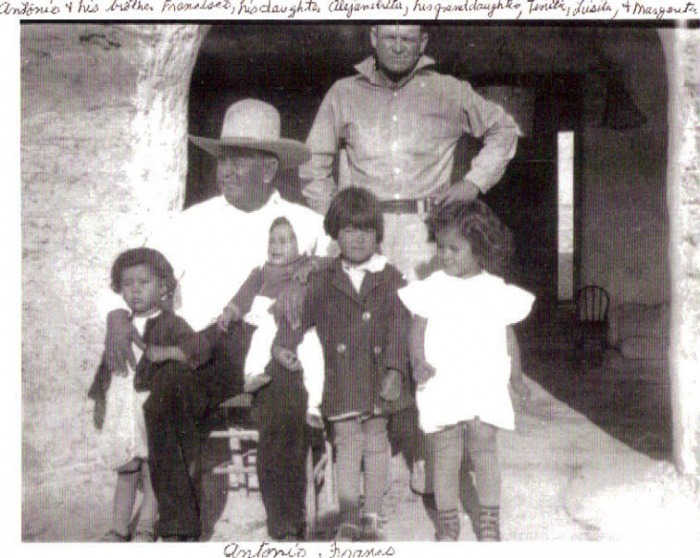 In later years when Antonio's own children asked him about his father, he told them he was an orphan and did not know his father. So the oral tradition was broken. The only oral tradition that survived was well known to all the family members was that the Francos came from Spain in 1802 somewhere in southern Mexico. How and when they made their way to Meoqui/Julimes area was not known. But some interesting connections have come up in the Franco Discussion page. Three years later in 1910 the US Census shows that Valentina and Antonio were living in Marathon with their two sons. Two year old Benigno had been born in "Terlingua," and one year old Manuel was born in Marathon. The census also shows that Antonio's cousin, 20 year old Jose Baeza Molinar, son of Victoriano and Jesusita Molinar, was living with them. Jose's oldest brother was Alberto Molinar. During this time Antonio was working as a freight wagon driver in Marathon. apparently Antonio and Valentina did not stay long in Marathon. They were back in the Terlingua area shortly. The rest of the family were probably born in "Terlingua." Were they born at the Franco ranch home? five years old, followed by three year-old Secundino, and cute little one-year old Juanita. it was at this time that Antonio was finally ready to buy his own land. Antonio Franco's best friend was his first cousin Alberto Molinar. On May 5, 1917 Antonio Franco and Alberto Molinar each bought 200 acres of Section 38. Nine months later, In March 1918 they went in together and bought the remaining 240 acres of Section 38. The result was that Alberto owned the northern half of Section 38 and Antonio owned the southern half. Antonio later acquired Section 30 which is just south of Section 38. It is after this that Antonio Franco had his home built facing the Rattlesnake Mountains rather than lined up with artificial north-South East-West directions. See the page: "The Antonio Franco Home" for more details on this. The Franco children who survived to adulthood. The Franco siblings who survived into adulthood. Antonio Franco's ranch home in 1925 view facing the front - The area behind the arches is "el zaguán." Just three months before her death Rita Franco said in an interview that Manuel Franco used to get up early in the morning and would milk the cows and put it in metal cans about two feet high. His sister Juanita would take some milk for household use, and Manuel would load the cans (like the one you see through the arch on the right hanging inside the zaguán) onto the cart you see on the right. He would go on horseback to Chisos (Terlingua Ghost town today) approximately seven miles north. Along the way he would pass a woman who also sold milk every day making her rounds. the mountains in the background are the Rattlesnake Mountains almost a mile away. We have a page dedicated to the Antonio Franco ranch home. Click the button below to see it. l-r: Antonio's daughter, Alejandra, then Tina, Louisa y Margarita his first 3 granddaughters. 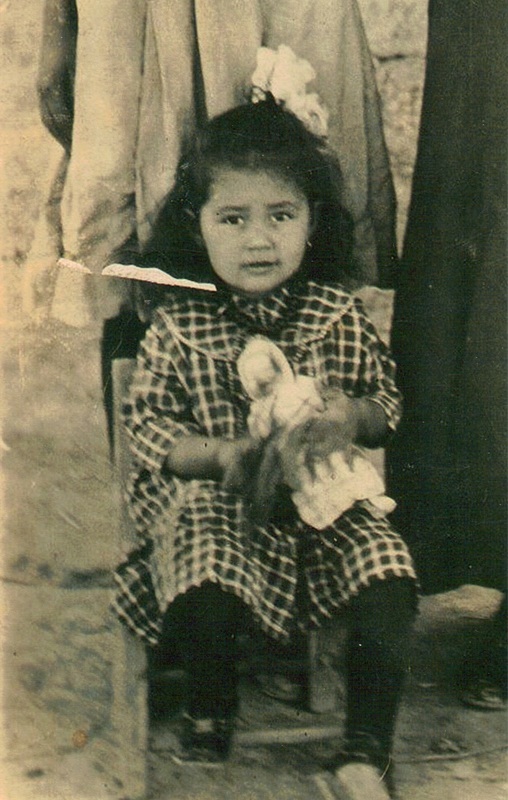 note: Louisa in this picture inspired the creation of Familias de Terlingua and contributed this photo. Click here to see the Ranch Ruins in Wikimapia. Click here to see the ranch ruins in Bing maps. Note: if you move the direction of north you can see it better. Ancestors for Antonio Molinar Franco up the Molinar lineage to Antonio González born 1580 in Portugal possibly in Óbidos which was known as the "villa de las Reinas" because for hundreds of years the kings gave the town to their wives. Obidos is about 40 miles north of Lisbon.